The Civil War Relay is a one-day, 52-mile relay race celebrating the interstate college football rivalry between the University of Oregon and Oregon State University, locally refereed to as "The Civil War." The direction of the route will depend on which school has the home game. The Civil War Relay has a long history - here is an article about one of the earlier ones that involved Steve Prefontaine. 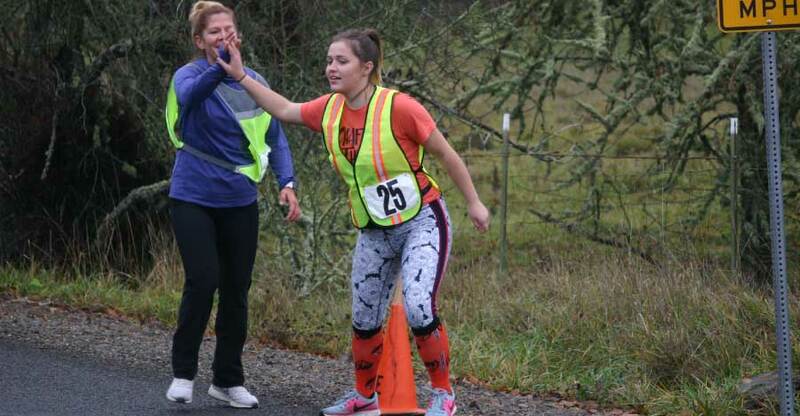 As this year's Civil War game is hosted by the Oregon, this year's Civil War Relay will start at the Linn Benton Community College Track in Albany. 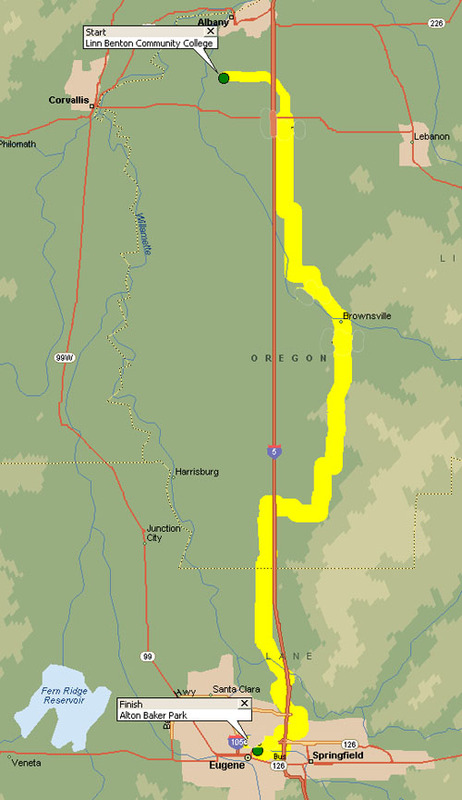 The course is divided into twenty-five legs and is rural in nature except for when arriving in Eugene. 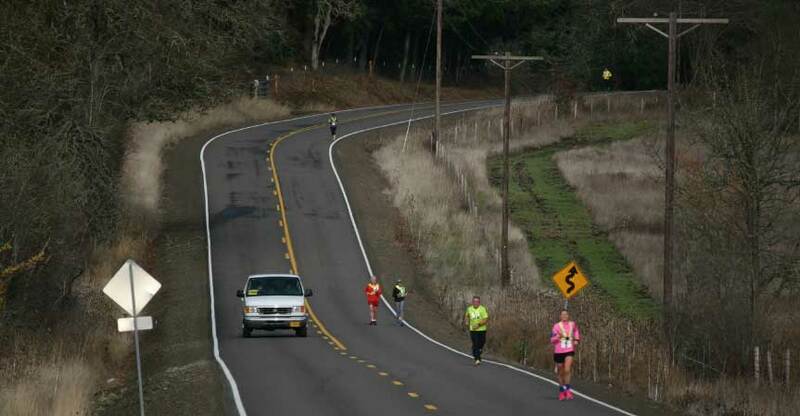 After starting, teams will run on the shoulders of the roads crossing through the scenic Oregon country side and small, quaint towns, to the finish line at Alton Baker Park in Eugene. 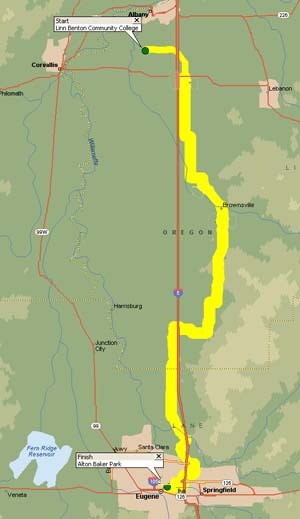 Each leg is around 2-miles which allows for a quick pace with less down time in case of a classic wet Oregon winter day. Teams will consist of up to five runners and there will be both a competitive category and a non-competitive category. Each person on a competitive team will run 5 legs and the team must maintain the running order, handing off at each exchange. In the non-competitive, or "Helter Skelter" category, runners do not have to maintain the running order but must still hand off at each exchange. High School teams are invited to participate and have a discounted registration fee. Teams are self supporting - teams are responsible for supplying their own vehicle (one only per team) and for stocking their vans with their own water, food, first aid supplies, etc. While directional arrows are placed on the course, the responsibility of knowing and following the prescribed course rests with each participant. Please always print, study and understand the leg maps. Hazards are not marked - runners should proceed with caution. The route is not closed to traffic - runners are running on the side of the road. Therefore, appropriate rules (for safety and for consideration to the people who live there) apply. 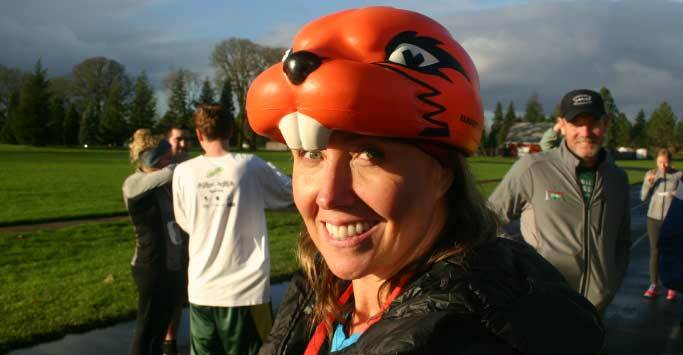 These rules are similar to USA Triathlon sanctioned events as their races are usually on open courses.